Luc Besson movies are unique experiences. The man has quite a flair for creating memorable visuals and he seems to have a thing for female-centric action movies. I suppose that's a natural side-effect of having been once married to Milla Jovovich, who has starred in quite a number of his movies. Lucy is a quirkier movie that seems like it could have worked with Jovovich as the protagonist, but instead we have Scarlett Johansson. I guess Besson was impressed with her work as the Black Widow in movies like The Avengers or something. Telling a good story is never easy, regardless of medium. Many times we just start with a small concept and then we build a larger narrative around it. When it comes to movies, I can totally understand how movies may even spring forth from a single idea for a visual or a particular shot and then you create something out of that. That's what this movie feels like. It feels like a rather small idea that got folks excited and so they build a larger story around it. Sadly, it's not much of a story, but at least the visuals remain pretty fun. Synopsis: Lucy is a 2014 science fiction action movie written and directed by Luc Besson. And before we go anywhere, I need to clearly remind everyone that the whole bit about people only using about 10% of their brain capacity is a big myth. Heck, even sites like CollegeHumor get to call out this silly "fact" that refuses to die. We start with a protagonist Lucy (Scarlett Johansson), who is an American living in Taiwan but barely speaks any of the Chinese dialects, apparently. Her latest boyfriend cons her into acting as a drug mule for him, but he gets killed in the process. Lucy gets sucked deeper into this Korean mob boss' little web and is again conscripted into becoming a drug mule for the drugs her boyfriend made her bring in. This results in several pouches of this strange blue crystalline drug to be sewn into each of their stomachs. But we jump forward to seeing Lucy as a captive and her guards beating her up rather brutally. And somehow kicking her in the gut breaks the pouch and her system is flooded with this wonder drug, something that results in her unlocking more and more of her mental capacity. She quickly overcomes her captors and proceeds to get the pouch fully extracted as we maps out her next steps. Around the same time, Professor Samuel Norman (Morgan Freeman) is giving a lecture about the whole 10% brain capacity thing and tries to speculate about what might happen if mankind could unlock more of their mental potential. In terms of the plot, so much of it is built around the 10% myth. Morgan Freeman's character's only function in this movie is to reiterate the myth. 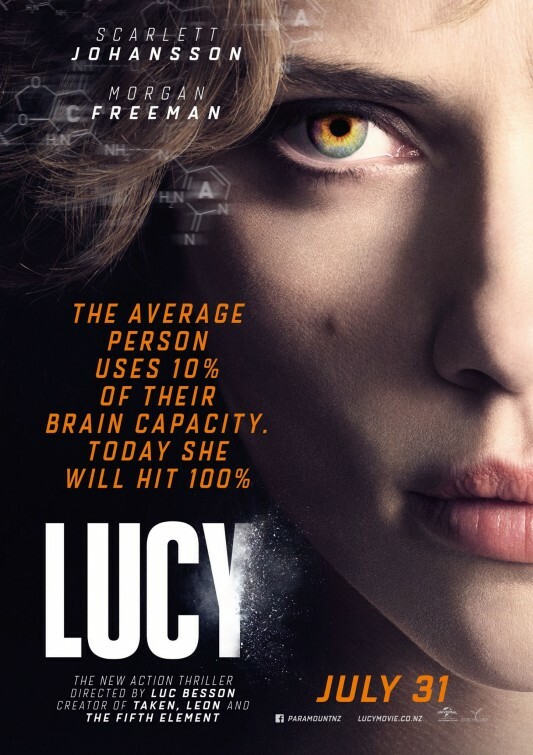 The movie is formatted around Lucy's growing potential with the huge title cards updating us about her approximate mental capacity percentage. And given this is wrong and even its use in this movie is so shallow beyond it being mentioned and a lot of wild speculation about it, it leave the plot without a foundation to stand on. And we all just have to endure it. In truth, the movie probably would have been a little better had it just been about Lucy getting mysterious superpowers and seeking revenge against those who wronged her. That is pretty much a summary of the plot at it's core, ignoring the trappings of the brain capacity thing and the really, really weird ending. But that's Luc Besson for you - he likes to think big and aim high. Outside the plot, there's a lot of fun to be had with Scarlett Johansson being all badass time and time again. She has gotten pretty good at her fight scenes and even with the use of stunt doubles here and there, she comes across pretty great when she is in front of the camera. She really knows how to project her whole tough girl image. All other characters in this movie are pretty much inconsequential. They try to introduce this police guy named Pierre Del Rio (Amr Waked), who is supposedly there to represent the audience trying to keep up with Lucy. As she evolves into this higher being that is pure intellect and zero emotion, Del Rio is supposed to be our anchor. But he doesn't really feel that way given his highly limited on-screen time and so we all just humor him until we get to the very end. The stupidity of the plot aside, Morgan Freeman was also a great casting choice. When you decide to create a movie with a silly premise based on an urban legend, there's nothing like the dulcet tones of Morgan Freeman to make the nonsense sound like gospel truth. He doesn't do much except provide exposition, but he does this pretty well indeed. Lucy was probably a fun concept that Luc Besson came up with while drinking with friends. He took this kernel of a movie idea and ran with it and thus created a fairly fun but ultimately pointless movie. That ending really killed me. But despite that, this movie still rates 3 blue drug pouches out of a possible 5.